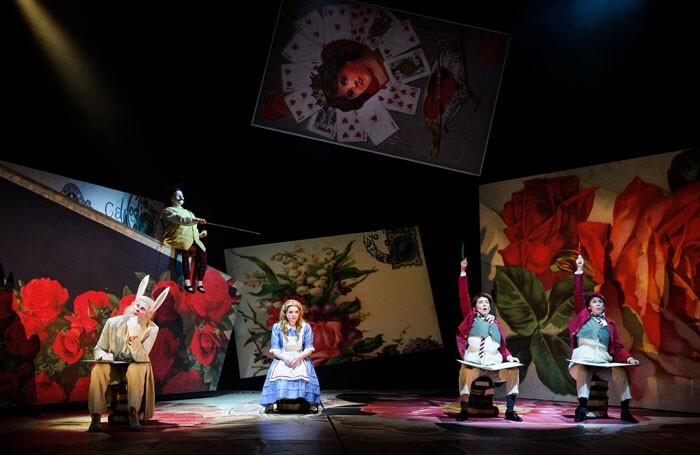 Will Todd and Maggie Gottlieb’s Alice’s Adventures in Wonderland featured in three consecutive seasons at Opera Holland Park before appearing at the Linbury Studio Theatre, and it shows. With much of the original cast in place, the characterisation of roles is strong and energetically performed across the board. The fairly monochromatic hue of the framing scenes, where Alice experiences the boredom of school holidays, contrasts with a brightly coloured Wonderland. The costumes and the set – the latter based on large picture postcards – are vividly eye-catching. The music features prominently throughout and is mostly, highly effective: Todd’s score relies heavily on pastiches of musicals, jazz and Latin American rhythms, but is skilfully put together, and the libretto is crisp and fresh (if occasionally possibly over the heads of littler ones – do they really know what ‘petits fours’ are?). There is not a weak link in the cast, in terms either of singing or acting. Director Martin Duncan has clearly worked hard with them to project an ideal balance of immediacy and picture-book fantasy. Even the smaller roles, such as Samantha Price’s and Daisy Brown’s Tweedledee and Tweedledum, show an impressive skill in physical comedy. Fflur Wyn is a wide-eyed Alice, but she has also the presence to draw the entire cast together. Keel Watson is a loafing, smoking caterpillar, who sings a cool blues; Fleur de Bray performs vocal acrobatics as the attention-seeking, prima-donna-ish ‘drink me’ Bottle. Maud Millar’s delightfully forgetful, jolly-hockey-sticks Duchess is an exceptional character portrait with very fine singing to match, and Robert Burt’s Queen of Hearts, while larger than life, is a cut above the typical pantomime dame.